Discuss Oliver Sacks’ “On the Move” with fellow SciFri Book Clubbers at the New York Botanical Garden. 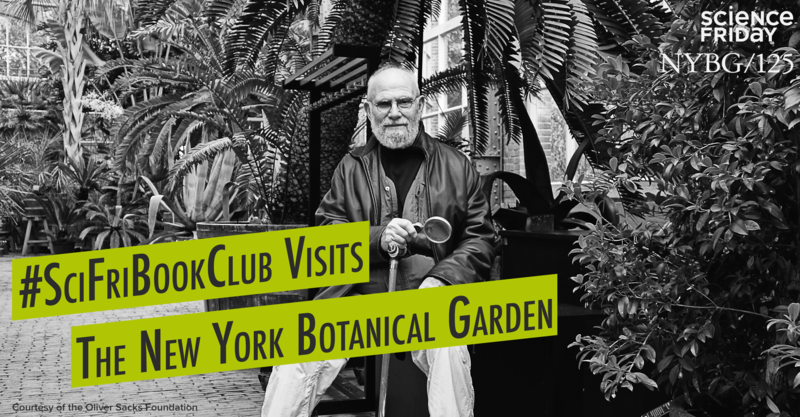 The NYBG was a special place for Dr. Sacks. That’s why we’re thrilled to make it the setting for our next Book Club Meet-Up! On Saturday, February 6th, join Ira Flatow, your fellow Book Club members, and special guest readers Dr. Danielle Ofri; Brain Pickings’ Maria Popova; Dr. Sacks’ longtime assistant and collaborator, Kate Edgar; and NYBG ferns curator (and friend of Dr. Sacks), Robbin Moran, for a wide-ranging discussion of On the Move. Then stick around for a special tour of Dr. Sacks’ beloved ferns and cycads, led by Moran, in the NYBG’s conservatory. It’s FREE to attend, but space is limited, so complete the form below to add your name to the list. Pre-registration is required, and we’ll confirm before the event that your spot has been reserved. Still need a book? You can order On the Move: A Life from Powell’s at a 30 percent discount. In the meantime, take a sneak peek at what’s in store by checking out this excerpt, about Sacks’ weightlifting days on Muscle Beach. Time: Discussion is at 2 p.m., followed by a 20-minute plant tour at 3 p.m.